When you need four digits and a comma to specify the amount of horsepower your car puts down, you know you're talking about something very, very special indeed. Such is the case for the Concept One, the first car from virtual unknown manufacturer Rimac Automobili, styled by designer Adriano Mudri. The firm (which is Croatian, not Italian, by the way) has created this machine and given it four electric motors. They combine for an astounding 1,088 horsepower but, perhaps even more importantly, enable torque vectoring across all four wheels -- varying the power at each corner to pull the car around turns. That performance equates to a 0 - 62MPH time of 2.8 seconds, while the maximum range is rated as 600km (about 375 miles) thanks to a 92kWh lithium ion phosphate (LiFePO4) battery. 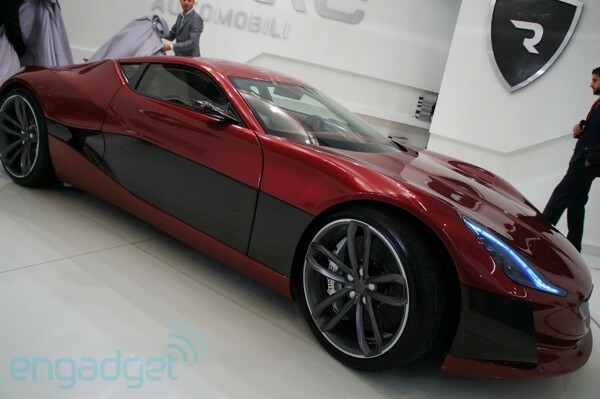 It is, alas, just a concept for now, but with a little bit of funding the folks at Rimac hope to bring it to market. And we hope they do too. Rimac Automobili unveils 1,088 horsepower Concept One electric supercar originally appeared on Engadget on Tue, 13 Sep 2011 11:41:00 EDT. Please see our terms for use of feeds.